The canons of page construction are a set of principles in the field of book design used to describe the ways that page proportions, margins and type areas (print spaces) of books are constructed. The notion of canons, or laws of form, of book page construction was popularized by Jan Tschichold in the mid to late twentieth century, based on the work of J. A. van de Graaf, Raúl M. Rosarivo, Hans Kayser, and others. Tschichold wrote, “Though largely forgotten today, methods and rules upon which it is impossible to improve have been developed for centuries. To produce perfect books these rules have to be brought to life and applied.” Kayser's 1946 Ein harmonikaler Teilungskanon had earlier used the term canon in this context. Typographers and book designers apply these principles to this day, with variations related to the availability of standardized paper sizes, and the diverse types of commercially printed books. The geometrical solution of the construction of Van de Graaf's canon, which works for any page width:height ratio, enables the book designer to position the text body in a specific area of the page. Using the canon, the proportions are maintained while creating pleasing and functional margins of size 1/9 and 2/9 of the page size. 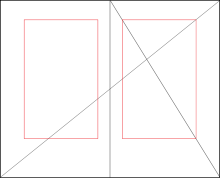 The resulting inside margin is one-half of the outside margin, and of proportions 2:3:4:6 (inner:top:outer:bottom) when the page proportion is 2:3 (more generally 1:R:2:2R for page proportion 1:R). This method was discovered by Van de Graaf, and used by Tschichold and other contemporary designers; they speculate that it may be older. The page proportions vary, but most commonly used is the 2:3 proportion. Tschichold writes "For purposes of better comparison I have based his figure on a page proportion of 2:3, which Van de Graaf does not use." In this canon the text area and page size are of same proportions, and the height of the text area equals the page width. This canon was popularized by Jan Tschichold in his book The Form of the Book. Tschichold's "golden canon of page construction" is based on simple integer ratios, equivalent to Rosarivo's "typographical divine proportion." Raúl Rosarivo analyzed Renaissance books with the help of a drafting compass and a ruler, and concluded in his Divina proporción tipográfica ("Typographical Divine Proportion", first published in 1947) that Gutenberg, Peter Schöffer, Nicolaus Jenson and others had applied the golden canon of page construction in their works. According to Rosarivo, his work and assertion that Gutenberg used the "golden number" 2:3, or "secret number" as he called it, to establish the harmonic relationships between the diverse parts of a work, was analyzed by experts at the Gutenberg Museum and re-published in the Gutenberg-Jahrbuch, its official magazine. Ros Vicente points out that Rosarivo "demonstrates that Gutenberg had a module different from the well-known one of Luca Pacioli" (the golden ratio). 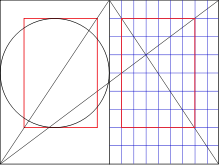 Historian John Man suggests that Gutenberg's Bible page was based on the golden ratio (commonly approximated as the decimal 0.618 or the ratio 5:8), and that the printed area also had that shape. He quotes the dimensions of Gutenberg's half-folio Bible page as 30.7 x 44.5 cm, a ratio of 1:1.45, close to Rosarivo's golden 2:3 (1.5) but not to the golden ratio 1.618. 1 2 3 Tschichold, Jan, The Form of the Book. p.46, Hartley & Marks (1991), ISBN 0-88179-116-4. ↑ Hans Kayser, Ein harmonikaler Teilungskanon: Analyse einer geometrischen Figur im Bauhüttenbuch Villard de Honnecourt (A canon for harmonious page division: analysis of a geometric figure in Bauhaus book of Villard de Honnecourt). Zurich: Occident-Verlag, 1946. cited by web page loaded 2006-09-11 Writings on Villard de Honnecourt, 1900-1949 "An article-length (p. 32) attempt to demonstrate the use of Pythagorian musical proportion as the basis for the geometry in three of Villard's figures: fol. 18r, two figures at the bottom; and fol. 19r, rightmost figure in the second row from the top. While the geometric design itself is unquestionably that generated from the Pythagorian monochord, Kayser does not convince the reader that Villard understood its musical basis. Kayser apparently worked from photographs of the original folios, and the significance of Kayser's claim may be summarized in his own admission (p.30) that Villard's geometry does not match that of the Pythagorean design when correctly drawn." ↑ Egger, Willi. "Help! The Typesetting Area" (PDF). De Nederlandstalige TeX Gebruikersgroep. Retrieved 2008-03-16. ↑ Tschichold, Jan, The Form of the Book. pp.28,37,48,51,58,61,138,167,174, Hartley & Marks (1991), ISBN 0-88179-116-4. ↑ Max, Stanley M. (2010) "The 'Golden Canon' of book-page construction: proving the proportions geometrically," Journal of Mathematics and the Arts, 4:3, 137-141. ↑ Carreras, Fabián, "Rosarivo 1903 - 2003". Retrieved 2008-03-16. ↑ Rosarivo, Raúl M., Divina proporción tipográfica, La Plata, Argentina, "[...] el número de oro o número clave en que Gutenberg se basó para establecer las relaciones armónicas que guardan las diversas partes de una obra"
1 2 Man, John, Gutenberg: How One Man Remade the World with Word (2002) pp.166–67, Wiley, ISBN 0-471-21823-5. "The half-folio page (30.7 x 44.5 cm) was made up of two rectangles — the whole page and its text area — based on the so called 'golden section', which specifies a crucial relationship between short and long sides, and produces an irrational number, as pi is, but is a ratio of about 5:8 (footnote: The ratio is 0.618.... ad inf commonly rounded to 0.625)"
Bringhurst, Robert (1999). The elements of typographic style. Point Roberts, WA: Hartley & Marks. p. 145. ISBN 0-88179-132-6. Burke, Christopher. Paul Renner : The Art of Typography. New York: Princeton Architectural Press. ISBN 1-56898-158-9. Hendel, Richard (1998). On book design. New Haven, Conn: Yale University Press. ISBN 0-300-07570-7. Hurlburt, Allen. Grid: A Modular System for the Design and Production of Newspapers, Magazines, and Books. New York: Wiley. ISBN 0-471-28923-X. Tschichold, Jan (1991). The form of the book: essays on the morality of good design. Point Roberts, WA: Hartley & Marks. ISBN 0-88179-116-4. Elam, Kimberly (2001). Geometry of design: studies in proportion and composition. New York: Princeton Architectural Press. ISBN 1-56898-249-6. "Rosarivo - Divina proporción tipográfica" (in Spanish). This article is issued from Wikipedia - version of the 3/24/2015. The text is available under the Creative Commons Attribution/Share Alike but additional terms may apply for the media files.